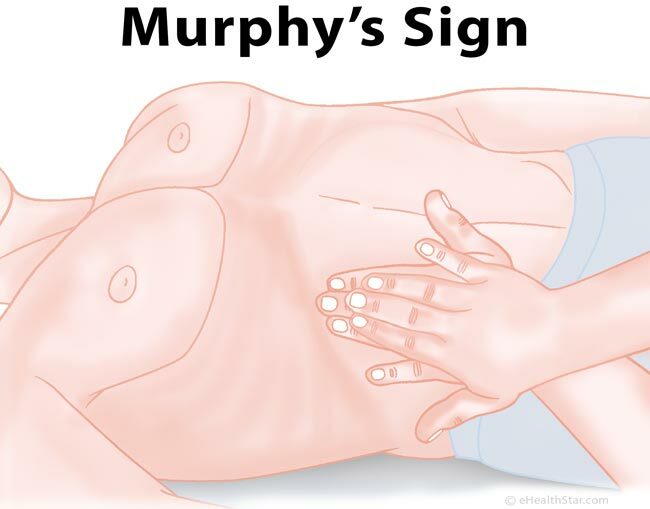 Murphy’s sign is a name of the maneuver by which a doctor tries to determine if your upper right abdominal pain arises from acute gallbladder inflammation (cholecystitis). You lie on the back. You breathe out, a doctor presses with the fingers below your right rib cage about 5 inches from the middle line and tells you to slowly breathe in. Pain during inhalation that makes you stop breathing (inspiratory arrest) is called a positive Murphy’s sign and suggests that you may have acute gallbladder inflammation rather than some other abdominal disorder. If you also feel pain while tested on the left side, you are probably just excessively sensitive; in this case, the test is considered false positive . Negative Murphy’s sign means no increase in pain during the inhalation part of the test. Murphy’s sign can be false negative in up to 50% of individuals (especially in elderly) with acute gallbladder inflammation [1,7]. Two of the reasons for a false negative test are an incorrect position of the examiner’s fingers and strong painkillers taken before the test . If you have gallstones that never cause you pain, you will also probably have negative Murphy’s sign (no pain during the test). The sensitivity of Murphy’s sign may be as low as 50%, which means that only about 50% of individuals with acute cholecystitis may feel pain during the test . The specificity of the test is around 80%, which means in about 80% of individuals the pain triggered by the test is due to acute cholecystitis and in about 20% of individuals due to other disorders [1,7], such as stones in the bile duct (choledocholithiasis), bacterial hepatitis or liver rupture. Sonographic Murphy’s sign (SMS) means tenderness over the gallbladder that is greater than in other abdominal areas when tested by an ultrasound probe . The test sensitivity exceeds 85% [3,5], but specificity may be as low as 35% [2,5].